Pumpkin Season Is BACK! 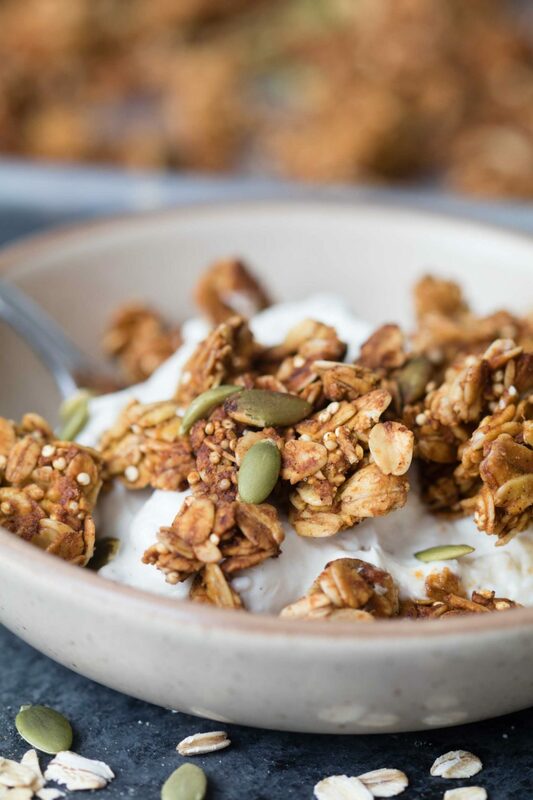 Try out this Protein Pumpkin Spice Homemade Granola for a low sugar, high protein granola. Once you make it from scratch you’ll never get store bought again! Fall is inching closer and like many other girls out there I am getting anxious about pumpkin spice everything. However, instead of a pumpkin spice latte or pumpkin spice cake…I wanted to enjoy the same pumpkin spice flavor but in something more nutritious for my body. Many store bought granolas are advertised as being nutritious but some are packed with almost the same amount of sugar as that pumpkin spice cake I just mentioned. When making homemade granola you are able to control the added sugars. I used honey for a natural sugar and no other additional sugars. (Except for the optional dark chocolate chips I added at the end). Oats are naturally high in fiber, and adding in seeds and nuts boosts the protein and healthy fat content. 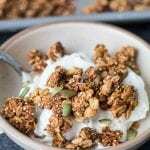 It is easy to go overboard on eating granola, so try to use it like decoration on your morning yogurt. Avoid excessively stirring the granola when baking and also – don’t touch granola when you take it out of the oven! Let it cool first. Is homemade granola good for you? Ah, the “is it good or bad for you” question. Homemade granola is a great option since you can control the added sugars and other ingredients mixed in to your granola. However, there are some healthful granolas you can also buy at the store as well. All in moderation. I eat about 1/4-1/3 cup of granola on my yogurt. Don’t make it the star of your meal – have fruit as well and maybe even hard boiled eggs! I keep my pumpkin spice granola in an airtight container in my pantry and it usually lasts a week or 2 to go through it. This will stay good for up to 1 month – but I hope you’d finish it before then! 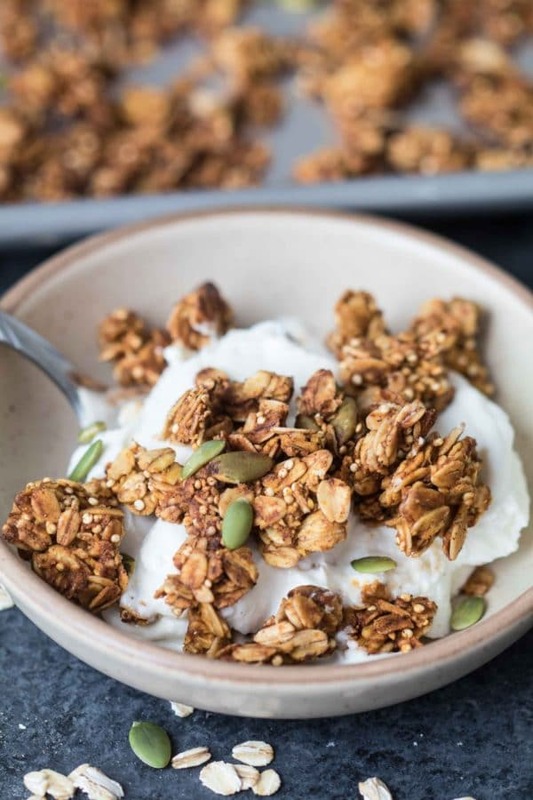 🙂 You can also freeze the granola too for up to 3-4 months! The cool thing about granola is that it is so customizable. 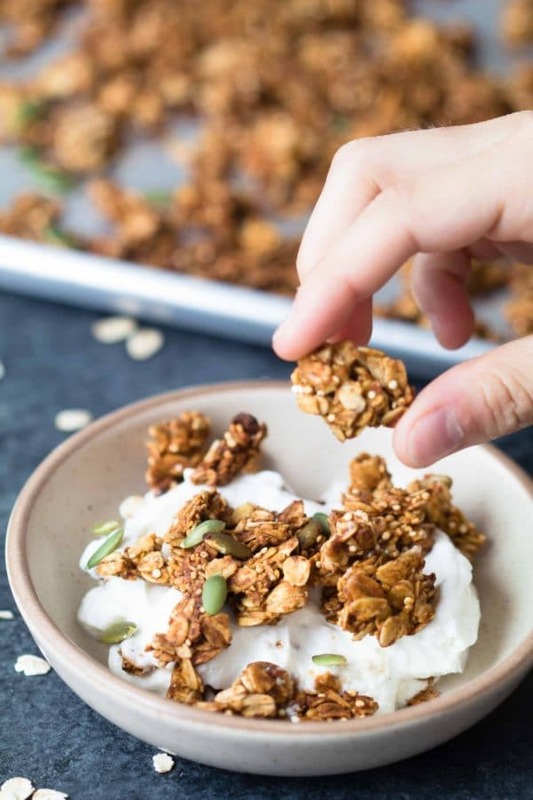 Even if you need an oat-free granola recipe, you can ditch the oats and add more nuts, seeds and dried and coconut flakes to bulk up the granola. Cooking this made the house smell soooo yummy and floods my mind with holiday memories. Funny how smells do that, huh? PIN this Protein Pumpkin Spice Granola recipe for later! What do you all like to cook or bake using pumpkin spice? I would love to hear! The smell of this protein pumpkin spice homemade granola will have your taste buds working overtime! Optional: 1 cup chocolate chips and/or chopped nuts I used 1/3 cup pepitas and 1//2 cup chopped walnuts. Preheat oven to 325 degrees F. Lightly grease two baking sheets. In a large bowl combine oats, quinoa, salt, nutmeg, cinnamon and pumpkin pie spice. (Stir in pepitas and walnuts also if using nuts or seeds.). In a small saucepan, heat honey, canola oil, vanilla, and pumpkin on low for 3-4 minutes. Pour the wet mixture over the oats and stir to coat well. Spread the oat mixture evenly on the baking sheet. Bake in 10-15 minute intervals, stirring slightly in between intervals. (Do not stir if you like chunks in your granola. Just turn the sheet pans so all sides get cooked evenly). Bake until oats turn a golden brown and looks like, well, granola! 🙂 It should take ~30 minutes. Cool completely, and then stir in chocolate chips. Store in jar or air tight container up to 2 weeks. Yuuuuummmmmmmmmmmmm!!! Now I’m inspired to make some!! This looks great and so easy! Love fall for treats just like this! This looks wonderful! Basic ingredients and not too complicated, which makes for a perfect recipe! I can’t wait to try it! What a perfect granola for the Fall season! Mmmm… pumpkin makes everything oh so good. : ) And I like that you’ve incorporated quinoa. Woops, I forgot, I actually use coconut oil in my granola. Avocado oil in the home made mayonnaise and salad dressings. So I’ve never made my own granola before. That being said- The quinoa that’s being used is it cooked quinoa or raw? Raw quinoa straight out of the bag/box! 🙂 Enjoy!! Is there anything better than homemade granola? I think not! YUM loved the addition of quinoa, thanks! Getting that extra protein in where ever we can! Thank you I’m glad you liked it! Any excuse to eat more pumpkin!!! This granola is the perfect fall topping for breakfast bowls of all kinds! Eating, sleeping and breathing pumpkin these days!! thank you!! Thank you! And yes, isn’t it awesome?! – that’s the great thing about granola, you can make simple adjustments and it always turns out tasty! Fall perfection. This is the only thing I will have over my overnight oats in the morning! Thank you so much Lorie – your overnight oats are incredible! Pumpkin granola is the ONLY kind of granola! !